The University of North Dakota’s (UND) Robin Hall opened last year as the tallest building in Grand Forks and the headquarters for the unmanned aircraft systems programs at UND’s nationally acclaimed John D. Odegard School of Aerospace Sciences. 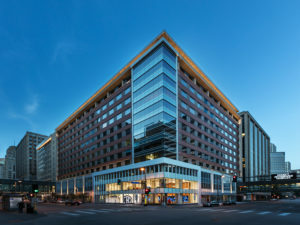 The new building’s sleek, light-filled design features curtainwall and storefront systems from Tubelite Inc. to meet the structure’s modern aesthetic, sustainability goals and performance requirements. The $22 million, 72,000-square-foot aerospace research facility was designed by ICON Architectural Group. Olaf Anderson Construction served as the general contractor. After more than a year of construction, the first students arrived in autumn for the 2016-17 academic year. Capturing these views, Brin enclosed the building’s tower on all sides using Tubelite 400 Series screw spline curtainwall. 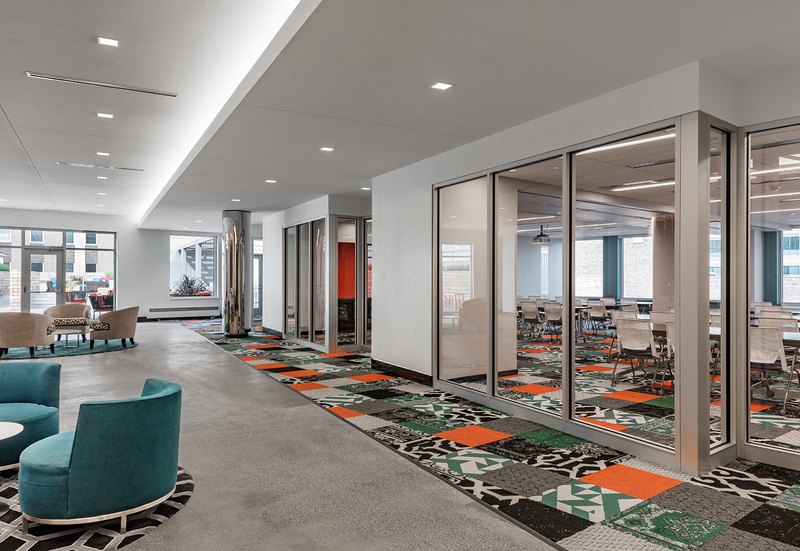 The aluminum-framed system was fabricated using 11,261 square feet of insulated glass with low-e coatings. “The tower’s glass is crystal clear. When backlit at night, it radiates across the campus. During the day, the interior is brightly lit with natural light,” describes Tovar. Screw-applied pressure bars secure the glass and a cover plate conceals the fasteners. Enhancing the tower’s structural performance, 17,500 pounds of steel reinforce the aluminum framing members. For added durability, Linetec applied a black anodize finish. 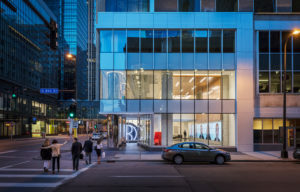 Including the curtainwall on the glass tower, the building’s façade showcases four Tubelite systems installed by Brin: Nearly 10,000 square feet of Tubelite’s 400 Series screw spline shear block curtainwall for the tower and lower levels; 1,400 square feet of 200 Series shear block curtainwall on the northwest corner; 13,000 square feet of 14000 I/O Series storefront for the punched openings; and 360 square feet of E4500 Series interior framing for the vestibule. All the aluminum framing was finished by Linetec in matching black anodize. An engineered floor truss deck system at the skylight base provided a staging area for materials and access to the anchor locations. From this vantage point, Brin’s glaziers used an overhead crane to set and secure the aluminum rafter and purlin sections atop the curtainwall. “Once on site, they completed each item quickly and were really good to work with. They definitely take a lot of pride in their craftsmanship,” praised Olaf Anderson’s Narum. Inside Robin Hall, four floors house a large auditorium, student study space, administration offices, classrooms, collaborative learning spaces and a hangar space for flight testing. The building’s basement also includes an open research space with laboratories and simulators. A skywalk directly connects the new facility to UND Aerospace’s Ina Mae Rude and Ryan Hall. UND’s School of Aerospace Sciences has seen tremendous growth. The university was the first to offer a bachelor’s degree in unmanned aircraft systems, which has been a major focus since 2008. Private donations and $1.5 million in matches from the North Dakota State Board of Higher Education Challenge Fund largely financed Robin Hall. The building’s name honors the largest contributors to the project, Mary E. Bazar and Si Robin. Grand Award Winner! Metal Architecture magazine’s Design Awards honors Shelby Farms Park’s First Tennessee Visitor Center in Memphis, which features Tubelite’s storefront system. One of the largest urban parks in the country, Shelby Farms recently implemented a master plan developed by James Corner Field Operations to revitalize the 4,500-acre park into a nationally renowned landmark. As part of the master plan, the $50 million, 180-acre Heart of the Park was completed in 2016, and consists of an ensemble of buildings and structures located around the 80-acre Hyde Lake. Designed by Marlon Blackwell Architects, the visitor center is an 8,000-square-foot building with a 7,560-square-foot covered porch. The cantilevered form glistens during the day from the reflected sunlight and glows at night when illuminated with site lighting. Read the full article on this award-winning project by clicking here. Honored as a Metal Architecture Design Award-winner, Knox College’s Whitcomb Art Center in Galesburg, Illinois, features Tubelite’s storefront system. The 29,950-square-foot art building designed by Lake|Flato Architects comprises five total bays, with three large ones connected by smaller bays. Large windows cut into the corners of the bays so anyone approaching from the campus can see deep into the building and students working on art. The corner windows also reveal the iconic tapered columns of a metal building system. Click here to read the entire article describing this award-winning project.